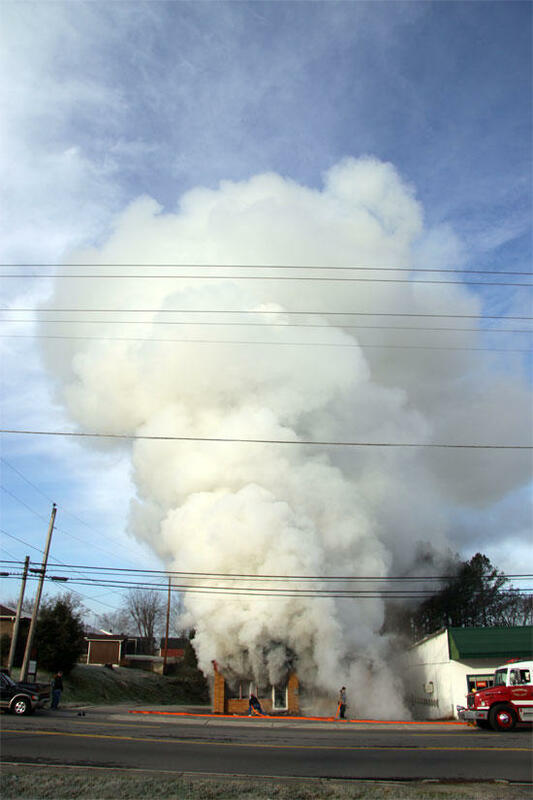 A fire which started around 8 this morning destroyed a building on South McCrary Street across from Brown-Spurlock Park that housed two businesses. Flames completely engulfed the building which was once home to Leo Parker Realty. The two businesses currently operating at the location are Second Best Consignment Shop and the web site known as the CannonWire. The street address for the consignment shop is 322 S. McCrary St. The building is located next door to Woodbury Lawn and Garden. The Woodbury Lawn and Garden building was not damaged by the blaze due to quick action by the Woodbury Fire Department. The Mooretown Volunteer Fire Department also responded to the fire. It took firefighters over an hour to extinguish the flames and areas at the back right side of the building were still smoldering at 11:30 a.m.
Woodbury Police Chief Tony Burnett said no one was believed to be in the building at the time the fire started and that the cause is under investigation. Really great pictures.. but very poor reporting. Would be nice to know if anybody was injured. Guess will have to read about it on the Wire. Nice edit and addition. Good to see your on your toes down there. Great pictures. Glad nobody was hurt. Hope the Wire is up and going again soon!